SCOPE Education Services is the largest child care provider in the state of New York, creating and maintaining a structured, caring setting where children can learn and grow at their own pace. All SCOPE child care programs are licensed by the New York State Office of Children and Family Services (OCFS) and are operated in public schools on Long Island. 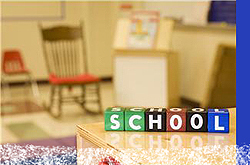 SCOPE Day Care programs provide a safe, fun, caring environment for the children of school district employees. Because we care for children beginning in infancy and extending through the school years, we can play a constant and familiar role in a child’s life. The programs are open to the children of all school district employees. Enrollment is on a first-come, first-serve basis, subject to limits by OCFS regulations. When necessary, children are placed on a waitlist for the next available opening. All staff undergo an extensive background check and meet or exceed all requirements set by the state of New York. Staff members are chosen based on our assessment of their nurturing abilities, patience, professional credentials and child care experience. SCOPE program supervisors and field trainers oversee the programs. In addition, OCFS inspectors visit the programs regularly. Parents pay all fees directly to SCOPE. The Basic Fee for full-time students in 2015-16 is $1006 per month. Fees are subject to change. Please contact SCOPE in order to obtain information regarding available programs and fees for your school district. Click here to view the list of SCOPE’s daycare programs.